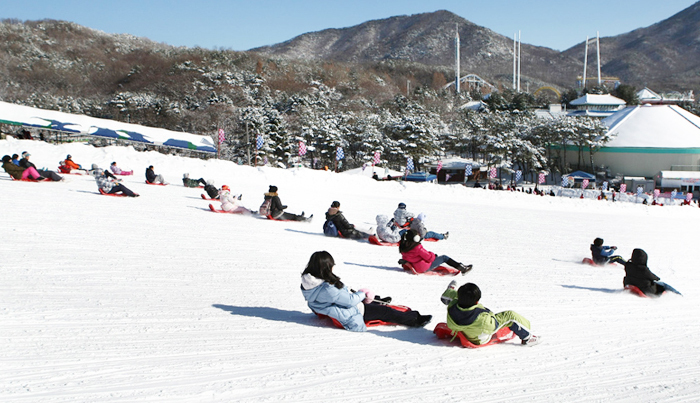 Many of us think of sledding as being downhill on snow, and this type of sledding is popular in Korea, however traditional sledding or ‘sseoulmae tagi‘ is something completely different. Korea is a land of mountains, at least 70% of the land area is mountainous, with long cold winters. Most of the mountains are forested which means they are not ideal for downhill sledding which is best on a more gradual slope. Nowadays with the high population density and large urban areas, along with the fact that farming uses all the suitable land it can, there really aren’t that many natural sledding slopes available. Nowadays most families go to ski resorts where slopes have been set aside for sledding. 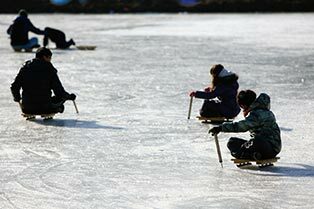 Traditional Korean sleds were, and still are, used on frozen rivers, streams and ponds. Instead of using a slope to move, this type of sledding uses uses a short sled and two sticks with spikes or nails in them to propel oneself forward across the ice. Some people kneel, while others prefer to sit cross legged. This form of sledding is far more strenuous than downhill sledding and nowadays you often see dads just pull their kids on the ice. It is easy to see how this small recreational type of sled developed from the larger sleds which hauled goods along the frozen rivers to deliver people and things from one town to the next. 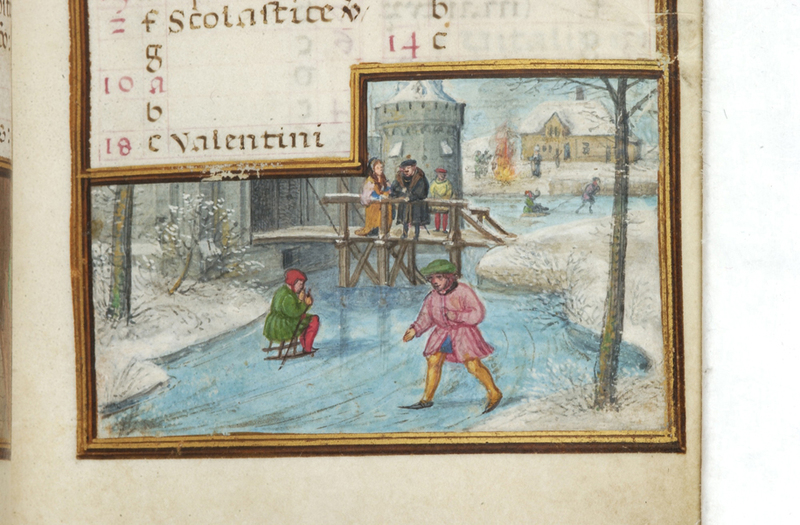 This type of sledding was also used in medieval Europe, particularly in Holland, although it seems to have died out there. Using sleds on ice was done in multiple northern countries. The original Middle English word for sled, ‘sledde’ meant slider, and was no doubt describing sleds that slid along ice, or even grass or on log rollers, rather than the downhill meaning it has nowadays. 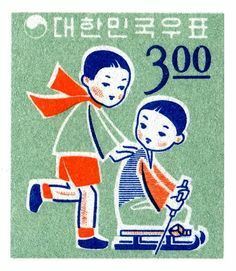 I hope that Korea continues to keep the traditional sledding alive as it is another of those old sports and pastimes that is danger of dying out. You might also enjoy Juryeonggu:A 14 Sided Die From The Golden Age Of Silla, Horseback Archery In Korea: A Traditional Sport, and Paengi:Korean Spinning Tops. Please do not use or copy without permission and accreditation. ← S.Korea’s Military Service Commitment, And The Actors And Idols It Impacts.